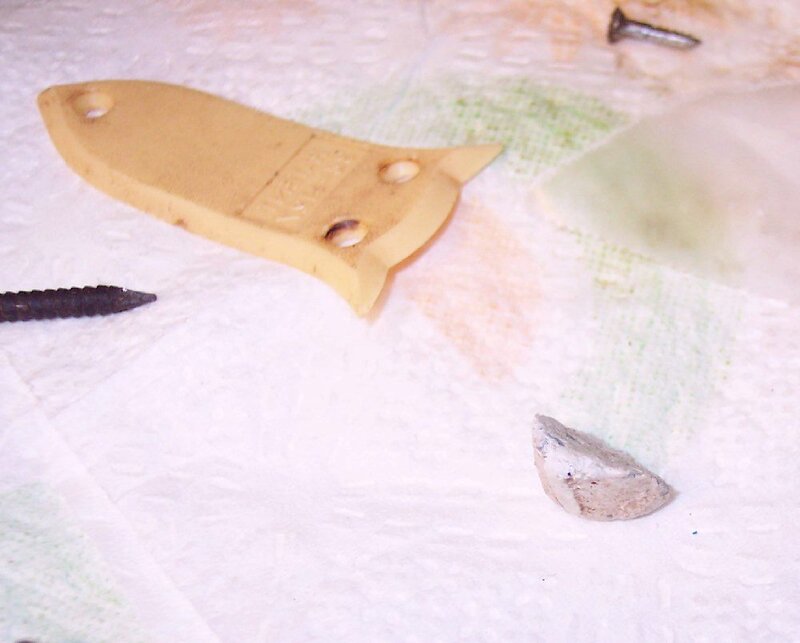 A small ball of 15 minute epoxy putty is made and allowed to sit until it's almost set (no longer sticky), then keeping the cavity moistened with water, it's pressed into the front corner of the cavity in a wedge shape. 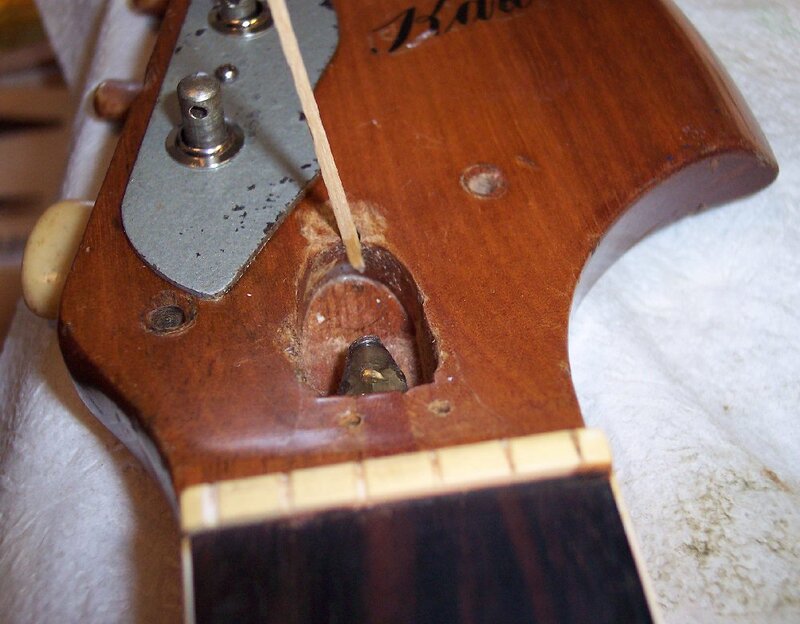 A flat toothpick is inserted and glued into the portion of the screw hole that is open to the truss rod cavity. 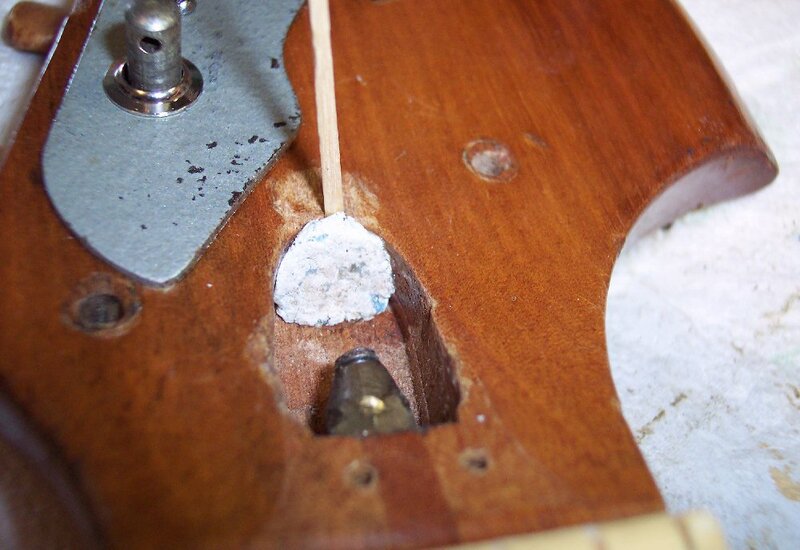 Then the front portion of the cavity is moistened with water so the epoxy in the next step will not stick. White Elmers Glue All is used to glue the epoxy plug in. The bottom of a food can turned upside down works very well as a glue pallet to mix the glue with water to a desired viscosity and drying consistancy. Apply the glue with a fine artists brush for exact placement / application of the glue. Then the epoxy wedge is teased out and set aside and primed with Elmers Glue All; Then dried with a small hand-held hair dryer. 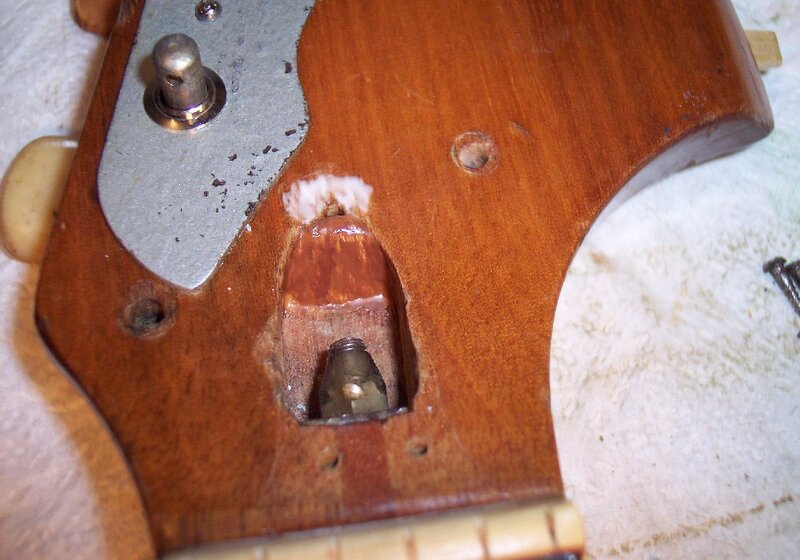 The front of the cavity is also primed with Elmers. After the Elmers glue primer has dried, then fresh Elmers is applied to both the wedge plug and the cavity area it will fit back into. The wedge is then pressed back into place in the cavity and smoothed out with small hand tools. After the Elmers dries again, another coat of Elmers is applied to fill any cracks and make a nice smoothe surface for camouflaging paint. That smoothing coat has not yet been applied in this picture, so you can see the roughness that will be filled by the Elmers top coat. With the Elmers top coat dried, the wedge plug is then streak painted with tan and brown water-based vinyl paint to mimick the wood grain; Water based vinyl paint works well with water based glues, even in mixing them together for any desired transluscence. 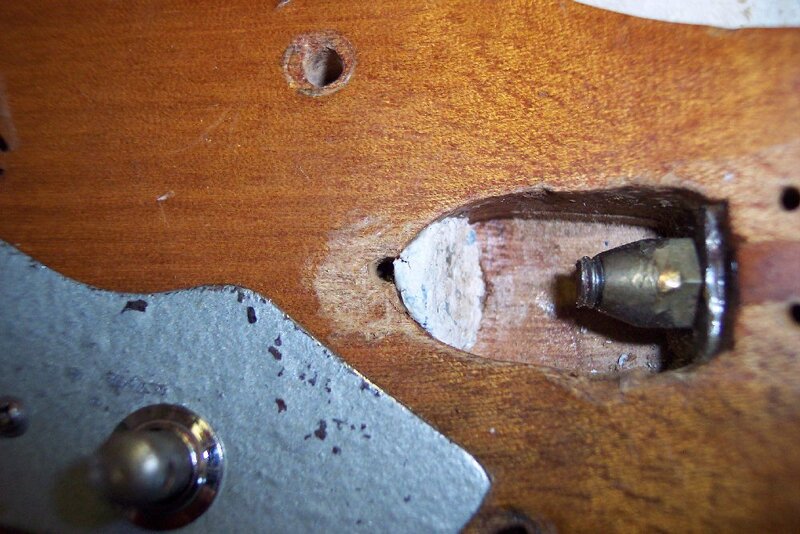 The white area in front of the screw hole is a coat of Elmers applied to a spot where uncured factory clear coat stuck to the trussrod cover and pulled off the first time the trussrod cover was removed (visible in the preceeding picture above). 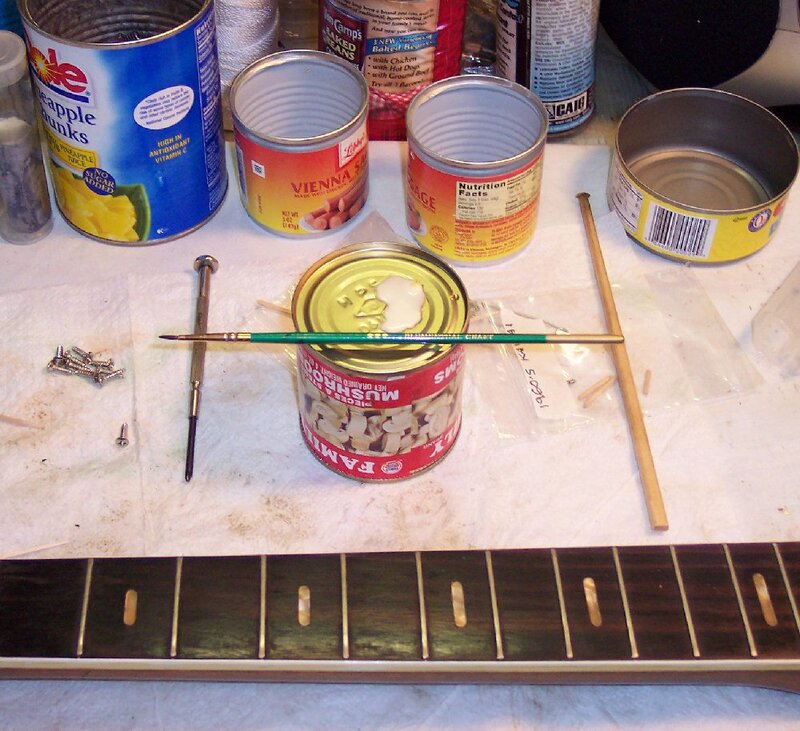 A thin coat of white glue works quite well in protected areas to make such scars look much better; It will dry clear with a yellowish tint very similar to old guitars age-yellowed clear coat.